Hotel Leela Kovalam, Leela Hotel Kovalam, Reservation for Hotel Leela, Kovalam, India. 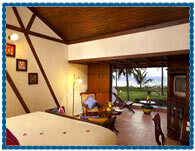 Address: Kovalam, Thiruvanathapuram -695527, India. Accessibility: 15 kms. from Airport, 15 kms. from Railway Station, 14 kms. from Bus Stand. 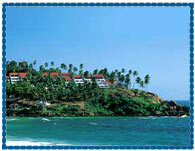 Leela Kovalam Beach is perched on a cliff, cradled between two wide sweeping eaches, spread over 44 acres, overlooking the Arabian Sea. It is the largest beach resort of Kerala offering a number of ways to enjoy the hospitality of a beach resort in Kerala like enjoy the delicious gourmet in the Shells Restaurant, enjoy a Backwater Cruise or make a rendezvous with the elephants at Periyar Wildlife sanctuary. Leela Kovalam Beach offers a total of 194 guestrooms and suits with a choice of Beach View Wing, Pavilion Wing and Sea View Wing. All the rooms are well furnished and designed in an ethnic Kerala style having all the modern amenities and facities for the full comfort of guests. Convention Centre, Meeting Rooms, Restaurant, Bar, Pool Lounge, Ayurveda and Wellness Spa, Fitness Centre, Snooker, Water Sports, Table Tennis, Speed Boat Ride, Beach Volleyball, Jogging Track, Facilities for Physically Challenged, Gift Shop, Chemist/Pharmacy (nearby), Car Parking and Valet Services, Currency Exchange, Florist, Library, News Stand, Laundry and Dry Cleaning, Concierge Services, Wake up Call Service, Doctor/Nurse on Call.